Yard Machines 243cc 2-Stage Snow Thrower 26"
This 243cc Yard Machines OHV Snow Thrower features a 26-inch clearing width and 21-inch intake height. Its automotive style, powder-coated paint offers a durable, long lasting finish to this snow thrower, which assembles in minutes no tools required. Taller poly chute focuses concentrated blasts of snow; arctic tested: won't rust, dent, or crack! 243cc 2-Stage Snow Thrower 26" This 243cc Yard Machines OHV Snow Thrower features a 26-inch clearing width and 21-inch intake height. Its automotive style, powder-coated paint offers a durable, long lasting finish to this snow thrower, which assembles in minutes no tools required. 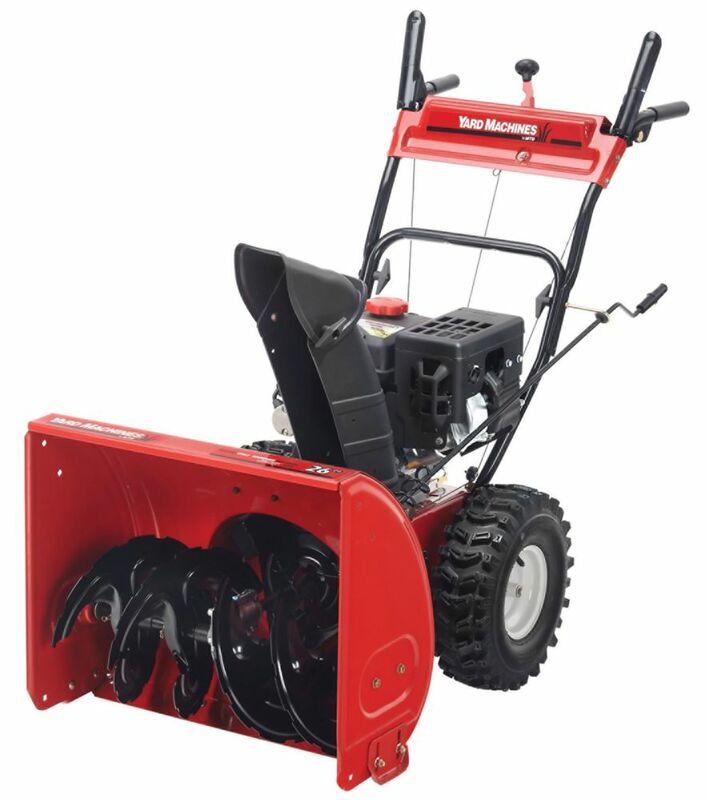 243cc 2-Stage Snow Thrower 26" is rated 4.8 out of 5 by 4. Rated 4 out of 5 by gerry from Good so far First time purchasing a snowblower - in my seventies. Used it three times - started first time each time with either pull or electric start. Last time I used it kept stalling when auger engaged. Checked augers and jamed with ice - removed ice and that was the problem. Also keeping machine outside so I got a cover from Home Depot that keeps it clean/protected. Not giving a five star until I have used it some more and haven’t had a major storm yet. Does this machine have a light? Thank you for your inquiry. This powerful two stage snow thrower offers great performance at an affordable price. It is not equipped with a headlight. For upgraded performance and the benefit of a headlight consider the Cub Cadet model 31DH55SB596 Home Depot item 1000841961. Thank-you for your question. The augers are a 14 gauge stamped steel and the transmission has an aluminum housing with a brass gear. Does this one have forward and reverse speed? Thank-you for your question. This unit is equipped with 6 forward speeds and 2 reserve. Does this machine have power steering? Thank-you for your question. No this unit does not come equipped with power steering. Thank-you for your question. Yes the unit is equipped with an electric start. The Manufacturer recommends the use of Home Depot item 1000845743 ATLAS Premiume Snow Thrower engine oil. Use fresh gasoline 87 Octane or higher, when possible choose a grade with no ehtanol content for reliable starts and best operation. Consider adding a fuel stabilizer if the equipment will be inactive for long periods such as off-season storage. Yes this model features a convenient electric start function as standard equipment. What is the horse power of the engine? its a 243cc engine - my guess is its about 8 hp.